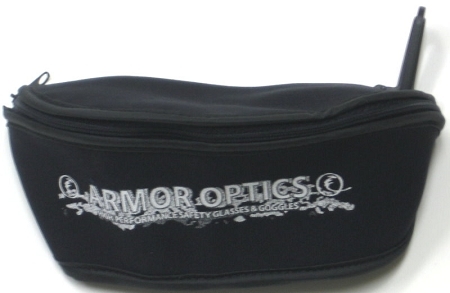 Armor Optics Black Glasses Goggles Soft Case. Black neoprene. Fits one pair of glasses or goggles, along with accessories. Zippered case with divider compartment. Two loops on the back so it can be worn on the belt. Also includes hook clasp to clip onto belt loop, tool bag, bike, etc. Made in Taiwan.